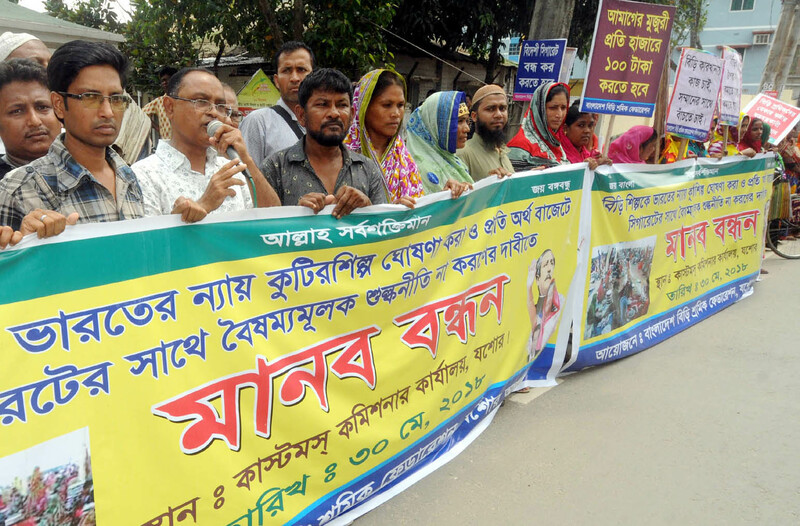 Demanding withdrawal of discriminatory tax imposed on the bidi sector, the southern region chapter of Bangladesh Bidi Sramik Federation on Wednesday formed a human chain in Jashore. Several thousands of bidi factory workers took part in the human chain formed in front of Jashore Customs Office in Jashore and shouted slogans demanding measures to save the country’s bidi industry. Speakers at the event alleged that high amount of taxes have been imposed on bidi in order to destroy the local bidi industry whereas low amount of taxes are charged on the imported cigarette. Later, they submitted a memorandum to the Chairman of National Board of Revenue (NBR) through the Commissioner of Jashore Customs and Excise and Vat Commissioerate. According to the memorandum, the demands of the bidi factory workers include the bidi industry should be declared as a cottage industry like in India and there should not be discriminatory tax policy in comparison with cigarettes in every budget. The memorandum also said thousands of people attached with bidi factories are now concerned to know that the bidi industry of the country will not sustain. The human chain was addressed by bidi Sramik Federation convenor Fazlur Rahman, worker’s leader Alamgir Hossain, Nur Azam, Maya Khatun and Khodeza Khatun.